Jessica Pearson is stepping out on her own. 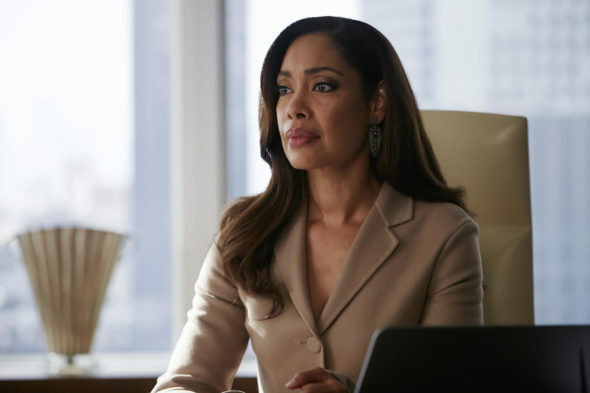 Today, USA Network announced the season seven finale of Suits will serve as a pilot for a Gina Torres spin-off series. Torres’ character, successful lawyer Jessica Pearson, has been with the legal drama since season one. The cast also includes Gabriel Macht, Patrick J. Adams, Rick Hoffman, Sarah Rafferty, and Meghan Markle. On the season seven finale of Suits, we’ll see Pearson adjust to her new life in Chicago where she “must rely on her legal wits and valiant relationships from Pearson Specter Litt to navigate this unknown territory.” The episode will serve as a pilot for a potential spin-off featuring Pearson. The finale/backdoor pilot is set to debut on USA Network in early 2018. NEW YORK, NY- August 16, 2017 – USA Network and Universal Cable Productions (UCP) today announced that the Season 7 finale of SUITS, airing in the first quarter of 2018, will serve as a potential spin-off that would center around powerhouse lawyer Jessica Pearson (Gina Torres). The pilot will be executive produced and written by SUITS creator and executive producer Aaron Korsh and executive producer Daniel Arkin, and will be directed by SUITS alum Anton Cropper (“House of Lies,” “Blackish”). Doug Liman, David Bartis and Gene Klein of Hypnotic (SUITS) will also serve as executive producers. The pivotal Season 7 finale will reunite Harvey Specter (Gabriel Macht), Mike Ross (Patrick J. Adams), Louis Litt (Rick Hoffman), Donna Paulsen (Sarah Rafferty) and Rachel Zane (Meghan Markle) with their old friend Pearson as she adjusts to her new life in the Windy City. When she is forced to enter the dirty world of Chicago politics, Pearson must rely on her legal wits and valiant relationships from Pearson Specter Litt to navigate this unknown territory. What do you think? Do you watch Suits? Would you watch a Jessica Pearson spin-off? More about: Suits, Suits: canceled or renewed?, USA Network TV shows: canceled or renewed? “Suits” is my favorite show! I have watched since it aired! However, I am disappointed that there are not more episodes; I always think they are neglecting us viewers. Yes, Gina Torres is a talented actress that should never be overlooked. (I really loved her in “Huge.”) However, if the network concentrates more on her show then “Suits”, I will be very disappointed. I loved her on Suits & miss her style on that show. But I would definitely check out her new show. One of my favorite TV actresses, I find her to be gorgeous, classy & intelligent. Will be watching! What this probably also means is a likely renewal for Suits itself. I can’t see ending the show with a backdoor pilot … I guess USA must be happy with the world of Suits or why have more?? It makes you wonder where it will shoot?? With Toronto now passing off as Chicago?? I guess it depends where Gina wants to work… I had heard that she wanted off of Suits to spend more time at home in LA..
Love Her. She is a terrific actress and was disappointed that she left Suits but now there is a spinoff coming with Gina Torres in it, I will be watching it. Hope it is as great as Suits. Love her. Hope it’s as good as Suits has been.